Yesterday's votes decided that we should do a Zombie theme today, in case you were wondering what happened to the little Cyclopee here. For those that are new here, cyclopees are one-eyed birds I designed a couple of years ago. Back in June I illustrated a piece that this sketch is an homage to. See for yourself. Comments, Retweets and sharing on facebook is encouraged. Spread the word, but make sure to mention us @salvatier or @romidion so we can keep track. At the end of this challenge I plan to give away some of these sketches to our helpful messengers. P.S. 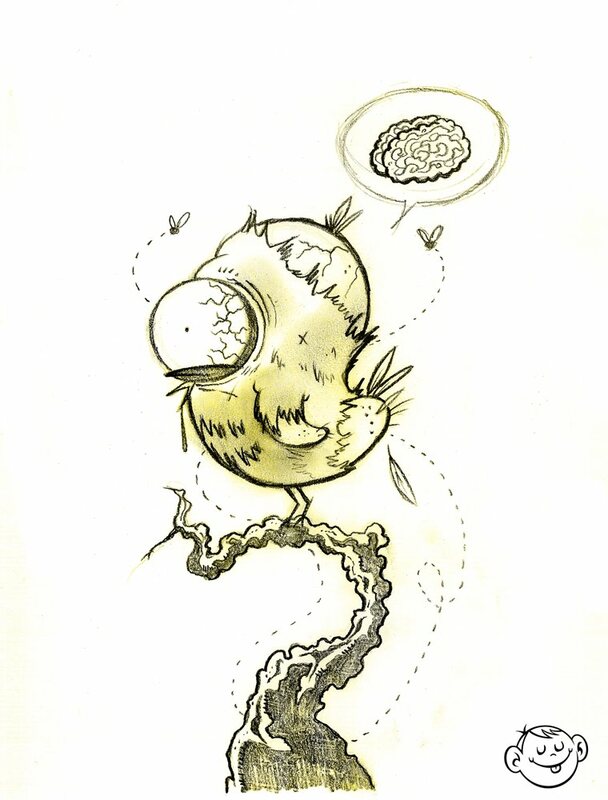 Don't forget to check out Dayne's zombie post and vote on sketch challenge #3. That's is awesome. I love this one so much. I like the original but this one tops it for me. I wouldn't mind seeing it as a print man. Awesome. Love it. Love the blog. I vote for harley. Thanks for the comments, guys. Make sure to check out Dayne's post too. And vote on tommorrow's. I like the original better. The color factor I think. Do love the Cyclopee. Well hello ^_^! I traveled back in time and saw the sketch, colored version and now the zombiefied version! Simply awesome! I saw Dayne's post as well! Also very cool! Can't wait to see challenge 3! Good luck! @TJ Wow, you were like Marty McFly and jumped all over the place! Thanks! Dennis -- great idea. Love your art. they are both really different, i think i like the more macabre version. great design! Cyclopee is a new one to me. This one seems like it would fit in a horror movie as a character. I am awed at how you can just produce these images on command. What a gift you have Dennis!